This bookwork was published in conjunction with Fade to Black, an exhibition pairing Joy Walker’s tape installations with photo-based prints of altered sheets of paper. Breaking from exhibition catalogue conventions, we allowed the design concept to naturally evolve from a series of loose conversations between the artist and designer Andrew Di Rosa, and his response to Walker’s works. Often beginning with a set of formal structures into which she introduces the element of chance as a creative tool, Walker’s practice is characterized by a series of small, simple actions that yield quietly monumental results. Accordingly, in order to emphasize experience over reading, the bookwork is intentionally as void of words as possible. We used an extremely thin paper that echoes the ephemeral nature of Walker’s materials. 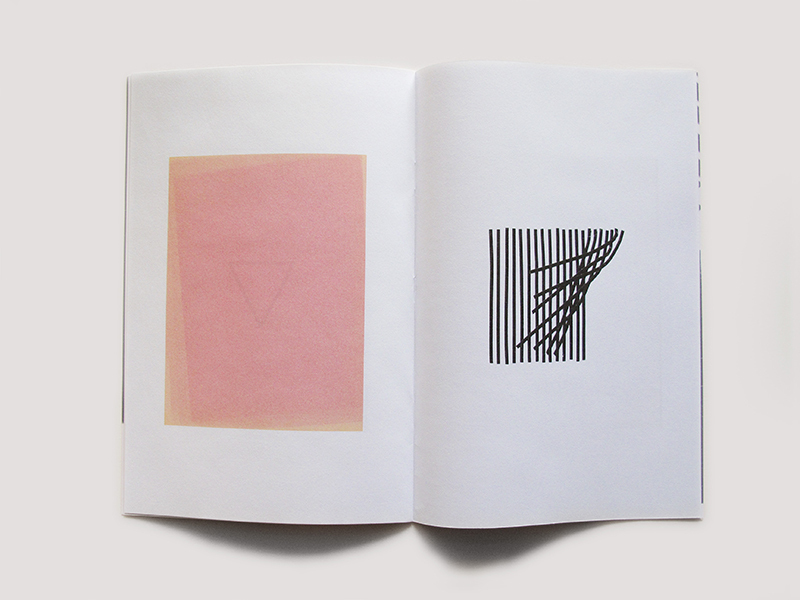 The qualities and sensitivities of Walker’s work are further enhanced when read through semi-transparent pages, which allow different works to overprint. The reader is presented with two readings from a single work: the faded works are seen alone and then coupled with superimposed images of sketchbook drawings that are the foundation for her tape works, and vice versa. 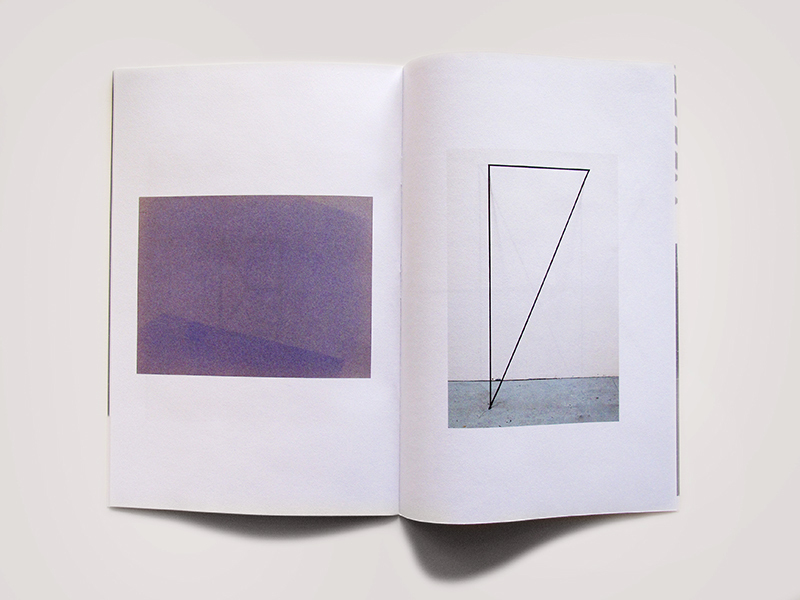 The pairing of these images across each spread also draws out the visual relationship between these distinct bodies of work, which are rooted in Walker’s interest in process, repetition, pattern, line, and geometry, and share an approach that bridges drawing and sculpture. The cover is an oversized double-sided poster variant of the book page, folded around the book and fastened with two white staples. When stacked, the spines playfully engage with line and pattern. Much as Walker calls attention to the ephemeral and overlooked elements of everyday life through her subtle manipulation of common materials, the thoughtful bookwork design encourages readers to engage with and reflect on the subtleties of Walker’s work. Joy Walker is a Toronto based artist and sometimes curator. She is interested in pattern, process and systems of repetition and, at the same time, in embracing chance by presenting moments of accidental wonder. 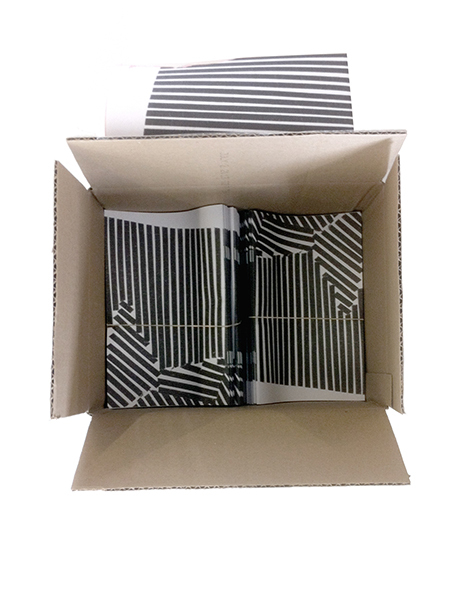 Walker’s practice includes printing, photography, drawing, video and sculpture. Walker’s recent solo exhibitions include Things Change at MKG127, Toronto; Fade to Black at Rodman Hall Art Centre/Brock University, St. Catharines; and Between The Lines at Harbourfront Centre, Toronto. Recent group exhibitions include More Than Two (Let It Make Itself) at The Power Plant, Toronto and Semicolon Hyphen Bracket at MKG127, Toronto. Her work is included in numerous private and public collections. Walker has been programming *QueenSpecific, a window gallery on Queen St. West in Toronto, since 2008. She is represented by MKG127 in Toronto. Rodman Hall Art Centre is a vital exhibition space for contemporary art, dedicated to enriching lives by connecting people to art and by providing accessible and meaningful opportunities for learning. As a public art gallery serving the Brock University community and the broader Niagara region, Rodman Hall encourages interdisciplinary conversations in the arts for new and diverse audiences though exhibitions, publications, public programs and educational offerings. The building is a unique facility comprised of a modern addition to the historic home of Thomas Rodman Merrit on a nine-acre property including a tiered escarpment garden that borders the Twelve Mile Creek. Presenting important bodies of work by artists from the Niagara region and from across Ontario and Canada, Rodman Hall encourages experimentation in exhibitions and publications, often adopting a collaborative curatorial approach and providing opportunities for the creation of new and site-responsive works and facilitating projects between artists. Rodman Hall prioritizes working with artists to develop unique publications that extend the exhibition beyond the gallery by emphasizing sensitive, responsive design that echoes the character of the work presented, while also contributing to contemporary art discourse through critical texts. Recent examples include Catherine Heard: Theatrum Mundi (2010), designed by factor[e] design initiative in consultation with Catherine Heard; Micah Lexier: A Week At A Glance (2011), designed by Tom Koken with Micah Lexier; and the forthcoming bookwork Olia Mishchenko: Ravine World, designed by Lewis Nicholson with Olia Mishchenko.